I stood in front of the class of kindergarten students on the first day of school, really confused. I had been the one who had invited these children to join the school, but something was wrong. They were much older than I remembered; some of them even had facial hair. Way too old to be in kindergarten. Plus, their parents kept hanging around in the classroom, and flat out refused to leave. I kept trying to tell them that I needed them to go, but I had this enormous wad of gum in my mouth that prevented me from talking properly. Every time I would try to take some of the gum out, more would take its place. Then I woke up. And it really was the first day of school. Back in the summer of 2005, when Gil and I were making plans to return to Tanzania, I got a phone call from the man who had been hired as the new director at Haven of Peace Academy. The elementary school principal had just stepped down, and the director wanted to know if I would be interested in the position. I thought about it a couple of days, sent a few emails back and forth, but never really seriously considered it. We had plans to start our family. I wanted to be a mom. Now that I actually am a principal at HOPAC, I've thought about that phone call a number of times this year. These days, I pinch myself because I can't believe that I get to do what I am doing. In some ways, it feels like my life has just gotten started. So this is what fulfillment feels like. I could have been doing this for the last thirteen years. Why did I wait so long? I think over the previous ten years when I spent the majority of my time with my kids, and how restless I felt during those years. I wasn't the kind of mom who delighted in coming up with crafts and treasure hunts for my little ones. The days often felt like they would never end, and I would count the minutes until nap time so that I could write a blog or work on an on-line class. Being patient and attentive was a deliberate, moment-by-moment, conscious decision. It usually didn't come naturally and I often failed. And to be honest, it didn't feel particularly fulfilling. A lot of the time, it just felt long and boring. This isn't about the whole debate between working moms and stay-at-home-moms, because I fully understand that it's a nuanced discussion, and for many women, they don't have a choice. But I do wonder--how hard should we run after fulfillment? It's amazing to get there, but is it everything? Should I have said yes to being principal thirteen years ago? Would I have been happier those thirteen years? Maybe I would have. Adult conversations and building up a school is a lot more fun than wiping spit-up and listening to Dora the Explorer or wrangling a two-year-old while trying to grocery shop. It's a lot more satisfying to tell people I'm a principal than trying to explain that my profession is "mom" or "I help my husband with his job." But is it everything? Should I have put a greater value on seeking my own fulfillment? That's the question. Was there value in being relatively insignificant and invisible all those years? Was there significance to what I was doing even if it didn't feel that way? I look back and I think there was. Bringing my kids home was practically a part-time job in itself during those years. In those days, my labor pains happened through hours of Dar es Salaam traffic as I made weekly trips to social welfare offices. It was arduous, but it was worth it. And once they did come home, giving my kids the stability that they craved, spending hours, days, months bonding--all of it was worth it. And I did do more than just stay home with my kids. I baked endless cupcakes for teenagers, I had the time to help new missionaries get settled, I helped to build up HOPAC--even if it was just behind the scenes. And in those years of restlessness, I learned that wrestling with contentment can be more valuable than years of fulfillment. That in dying to my own desires, I learned to live. I want to remember that, because I also know that fulfillment is fleeting. 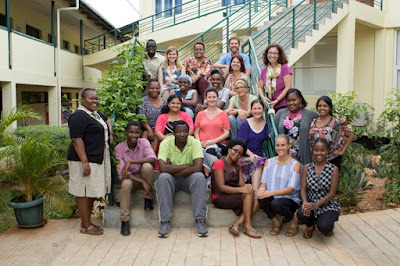 Our future in Tanzania is uncertain, and despite how much I love what I am doing, I don't know how long I'll get to do it. It's quite possible that someday in the near future, I'll end up as a stay-at-home-mom again, needing to homeschool my kids. And if that happens, I don't want the thirst for fulfillment to cloud my vision of what is more important. 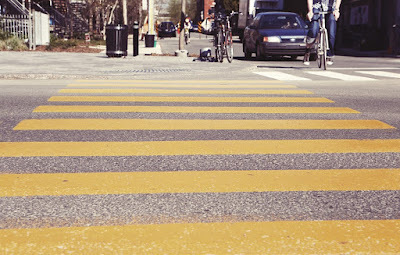 When I was a young girl, I had a phobia of crossing streets. I would avoid it whenever possible, even if that meant walking much farther away. When it was absolutely necessary to cross a street, I would cling to whoever I was with as if my life depended on it. I was kind of a wimpy kid, so I just figured that this phobia reflected my general cautiousness. Most people were braver than me, I thought. When I was about twelve, my mom casually referred to a story of how I was almost hit by a car when I was two. I was immediately interested, which surprised my mom because she thought I had remembered it. So she told me the story in detail, of how a car was speeding on a residential street and had to slam on the brakes to avoid hitting me. I was fine, but my mom, the driver, and myself were all in tears. 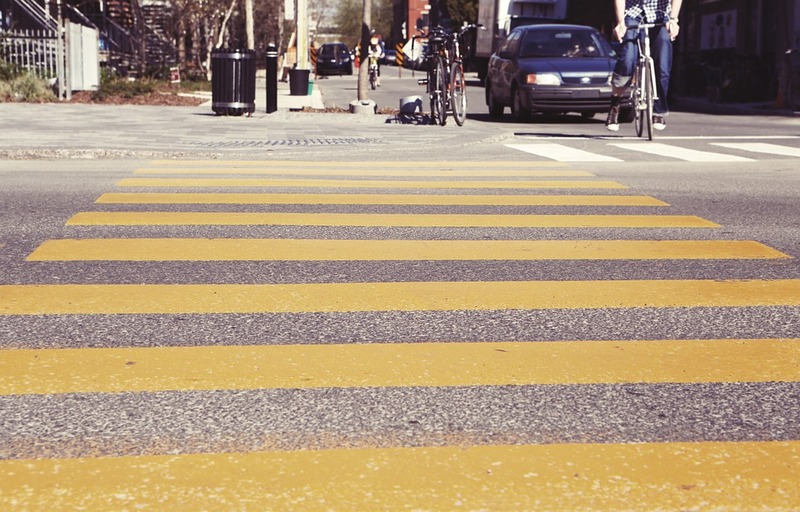 Not long after hearing the story, I realized that my paranoia of crossing streets had disappeared completely. Understanding the cause of the phobia was all my brain needed to get rid of the fear. Though I didn't know it at the time, it was my first experience with the effect that trauma can have on the brain. I realize that this example of trauma is, relatively speaking, pretty insignificant. The older I am, the more I realize how unusual it was that I grew up in a stable, loving home and rather ignorant of the abuse or neglect that so many children experience. 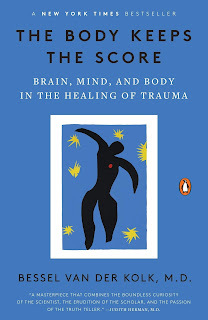 But becoming an adoptive mom propelled me into the world of trauma and trying to understand it, which is what led me to read The Body Keeps the Score: Brain, Mind and Body in the Healing of Trauma. Dr. Van der Kolk delves deep into the research of how trauma (especially in childhood) fundamentally changes the brain. "[Trauma] changes not only how we think and what we think about, but also our very capacity to think." This fascinating book was incredibly useful to me as an adoptive mom, helping me to understand more fully what is going on in my children's brains and what is causing some of their behavior. For example, "Children who don’t feel safe in infancy have trouble regulating their moods and emotional responses as they grow older." Aha! Just that statement alone explains a lot about a child of mine. This book gave me significantly more empathy towards friends who have experienced trauma. And even though I wouldn't describe myself as a traumatized person, it helped me to understand more about my own emotions. "No matter how much insight and understanding we develop, the rational brain is basically impotent to talk the emotional brain out of its own reality." Yes! I've experienced that. Interestingly, the author explains that the key to developing emotion regulation is in the physical body--by using the mind to be more aware of what is happening in the body when our emotions are out of control. And that by doing so, remarkably, we can actually re-wire our own brains. "[R]ather than being a passive observer, this mindful Self can help reorganize the inner system and communicate with the parts in ways that help those parts trust that there is someone inside who can handle things." What is the Self? What is the Mind? It's certainly not a biological entity. Could it be, perhaps, the immaterial Imago Dei, the part of ourselves that the Bible would call the Soul? This concept also begs the question--if the Soul and the Body, working together, are able to re-wire--literally change the biology--of our brains in order to recover from trauma, then why then does our culture tell us that we must give in to our emotions, "follow our hearts," in order to find personal fulfillment? Why is the key to conquering traumatic experiences lie in connecting our mind with our body, but when it comes to sexuality, personality, and gender expression, we are supposed to ignore our physical bodies? It was these questions that I took into my next book, Love Thy Body: Answering Hard Questions about Life and Sexuality by Nancy Pearcey. 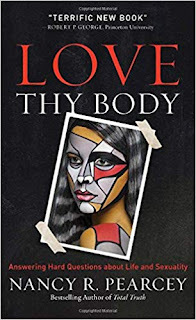 And I was fascinated by how, even though The Body Keeps the Score and Love Thy Body are written on very different topics and on very different premises, they speak to each other. 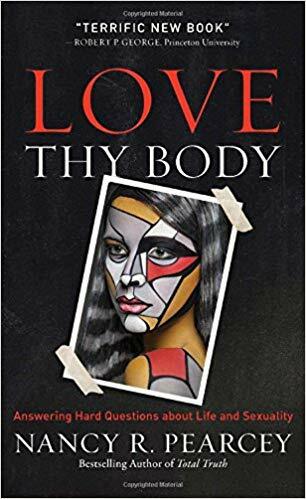 Even though Nancy Pearcey never references Dr.Van der Kolk, she takes his concepts to their logical end: If we are able to use our mind and body to change our feelings, why do we consider our feelings to be sovereign in our lives--even over our own bodies? "The body has become a morally neutral piece of matter that can be manipulated for whatever purposes the self may impose on it—like pressing a mold into clay or stamping Lincoln’s profile on a copper penny," Pearcey writes. She explains how current cultural ideas about unborn life, sexuality, gender, and family all come down to a very low view of the physical body, which leads to an extremely fractured view of the Self....which, ironically, is exactly what trauma therapy strives to fix. It's interesting how willing I am to apply Van der Kolk's research when I am feeling afraid or anxious, because I want to control unpleasant feelings. But what about happiness that is actually rooted in selfishness? What about jealousy or bitterness--emotions that are easy to relish? If I can use my body and my soul to rewire uncomfortable emotions, why not others as well--emotions that the Bible would call 'sin?' 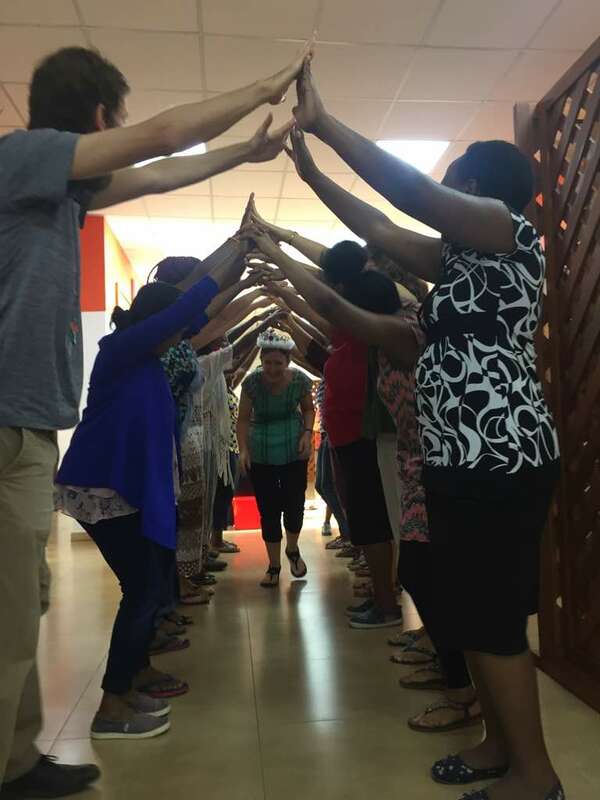 Pearcey writes, "We do not choose our feelings, but we do choose our behavior and identity." She doesn't parse Scripture in her arguments--that's not what this book is about. She uses biblical worldview--the over-arching, big-picture view of life presented throughout the Bible--to explain the significance of our biological bodies. "In one sense, our bodies even have primacy over our spirits. After all, the body is the only avenue we have for expressing our inner life or for knowing another person’s inner life. The body is the means by which the invisible is made visible." Pearcey also explains how the roots of the mind-body dualism that is so prevalent in our culture traces back to Rousseau. Worldviews all come from somewhere, and ideas have consequences. She writes, "Humans are not self-creating, self-existent, self-defining beings. We all look to outside sources to inform us about who we are and how we should live. We look for a rule or grid to help us decide which feelings and impulses are good versus those that are unhealthy or immoral and should be rechanneled." Where is my grid coming from? Rousseau? Or the Bible? I don't fully understand all of this. I am not a doctor or a psychologist or a scientist. I'm just a thinker asking questions. So if you challenge me on these thoughts, I'm not sure I'll have the answers. If this fascinates you, read these books. Seriously, read these books, and read both of them together. Then let's have a conversation. I came off the mission field with a new mission which is to burn down missions. Before I post my writing, I often will ask Gil to read it and give me advice. Occasionally I've asked a friend or my parents to read something before I publish it. And the editor of A Life Overseas always helps me with those blog posts. But the piece you'll see below hit a new record for me--eight editors, the most I've ever asked for. That's because what I wrote here is very important to me. I hope you will read it. Corey Pigg: They [our organization] were sending us out to the 10/40 window. Jamie Wright: Yes, the 10/40 window. Everybody loves that. Corey: They felt it was imperative that we went to closed nations to be superheroes. Because those are the last places that need to hear the gospel. Jamie. Which is hilarious. ……All that matters is that you use the lingo. Corey: That’s what sells, right? Hi, I’m Amy Medina, and I’m a missionary. 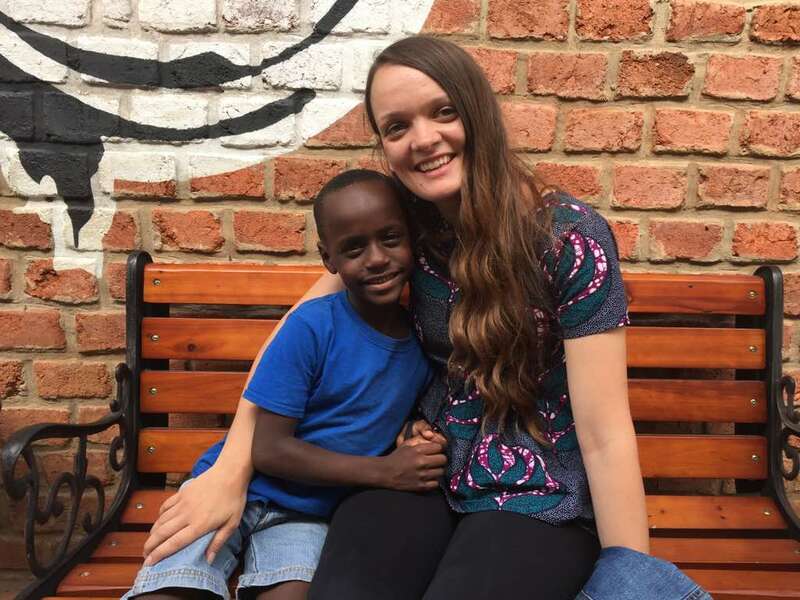 I was a missionary kid in Liberia and Ethiopia for six years of my childhood. 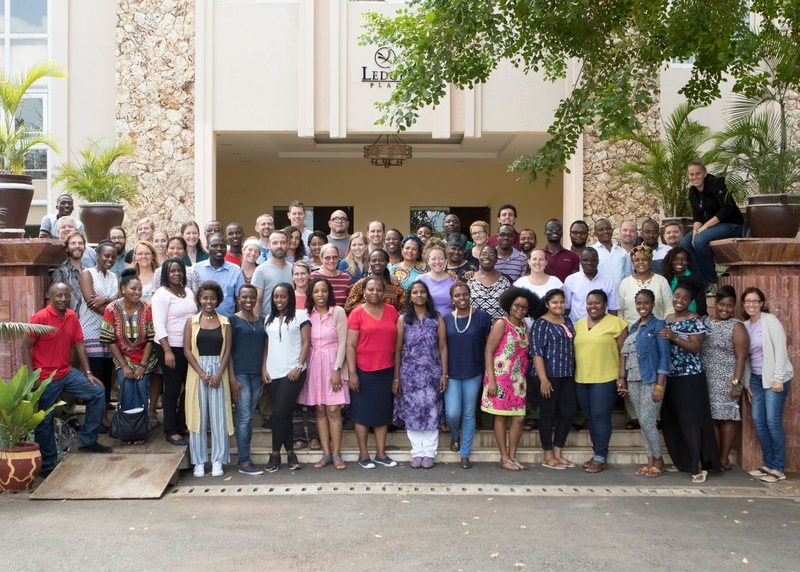 I’m now 41 years old and have been living in Dar es Salaam, Tanzania, for fourteen years as an evangelical Christian missionary. My husband trains pastors and I am the elementary school principal at Haven of Peace Academy. We’ve adopted four Tanzanian kids. We live off of the financial gifts of churches and friends from the States. We write newsletters every month. We use phrases like “fruit of our ministry” and “unreached people groups” and “discipleship.” I blog. And my blog header has zebras on it. And a rainbow encircling an orphan. So is my life a joke? I’ve been mulling over what I read in Jamie Wright’s memoir, The Very Worst Missionary: A Memoir or Whatever and what I heard in the “Failed Missionary” podcasts with Corey Pigg, Emily Worrall of Barbie Savior, and Jamie Wright. I’ve known all along that some non-Christians scoff at my life as a misguided, ridiculous attempt to “save the world,” but I must admit I was surprised to find out that there are some of “our own” who feel the same way–and are loudly proclaiming it. Ironically, I actually agree with a lot of what these critical voices have to say about missions. I believe that “calling” can be misguided and even idolatrous. I believe that missionaries need to be well-vetted, well-trained, and held accountable. I’m confident that there is a temptation among missionaries to hide their struggles and beef up their successes. I believe that the “white savior complex” is real and sinister, and I definitely hold that Americans need to stop shipping stuff overseas for poor people. And I do think that missions in general, but especially short-term missions, can often bring more harm than help. So I don’t believe we should write off these critical voices. If we stand against them with scowling faces and hands over our ears, angry at their profanity or their bluntness or their criticism of our sacred cows, then we walk right into the realm of the Pharisees. I’m not saying we have to agree with everything they say or how they say it, but we need to listen. The truth is, it’s not a bad thing to knock missionaries off those pedestals. And it’s not a bad thing for us missionaries to ask ourselves the hard questions, or for those who send us to ask those questions of us. Why did I really become a missionary? Was I running away from something? Was I just looking for more meaning in my life? Was I thinking that missions would elevate my life to a higher spiritual level? Does my dependence on financial support make me cover up the truth or portray myself as something I am not? Am I afraid of what would happen if people could see bank records or my internet history, or if they saw what a day in my life really looked like? Am I really the best person at this time and in this place to be doing this job? Am I submitting myself to accountability? Am I humbling myself and my ideas to the local people? Almost my entire life has been devoted to missions, in one way or another. And I’ve seen what these critics are talking about. I’ve seen terrible short-term teams who offend the local people or steal jobs in a struggling economy. In rare instances, I’ve known of missionaries who preach the gospel on Sunday and have affairs during the week. More commonly, I’ve seen ignorance and arrogance and racism among missionaries–including myself. But my conclusion is different. 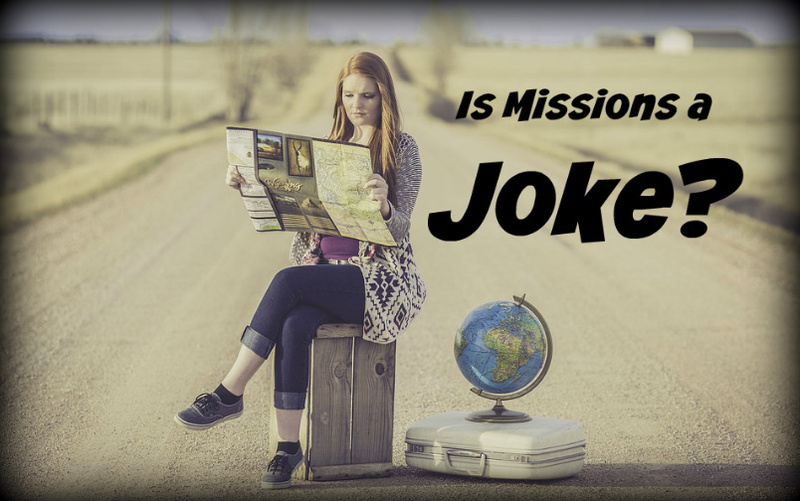 I don’t believe missions needs “gasoline and a match,” as Jamie writes in her memoir. Really what it comes down to is this: Do we have a message worth sharing? The data suggests we do. Lily running the 5K with her "Aunt" Lauren who ran the whole thing with her. 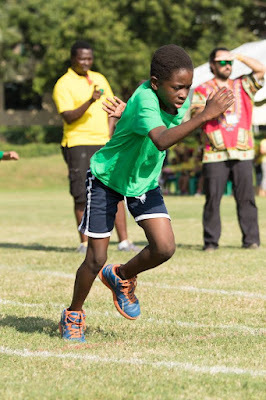 Josiah on Sports Day....my super speedy boy! Ah....these people! They are my favorite! This was the Primary (Elementary) School staff at HOPAC this year. Celebrating the last day of school! Our friend Amanda Kay visited us for a couple of weeks (she goes all the way back to our college days! ), so of course, we needed to take her on safari. We had a fun visit with Hannah, who was a very special person in Johnny's life around the time we brought him home from Forever Angels. Then my parents visited for a couple of weeks, so we took them to Morogoro, where we chased waterfalls upstream and hunted for glittering river stones. This sweet girl, Bethany (who we even knew in utero! ), made it over to visit us during her internship in Dar this summer.